For home PC users a firewall and anti-virus programme represent the bare minimum of security levels. What exactly do these programmes do? How do you find out which one’s best for you? And what else can you do to improve your PC security? You probably already have an antivirus programme on your computer – most new PCs arrive with some installed. This software isn’t an optional extra: it’s vital to protect your computer against viruses, worms, and Trojans. Don’t make the mistake of thinking “it will never happen to me” – computer viruses hit hard and fast. They are designed to be malicious: often, they’ll replicate themselves, shut down your PC, destroy files, or corrupt your programmes. It will take a PC expert to fix your computer, and there’s no guarantee you’ll get your files back. The message? If your computer holds any data you wouldn’t like to lose – then insure it by installing antivirus. It’s that simple. 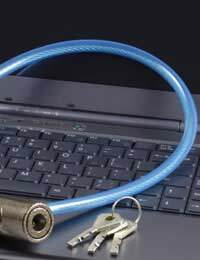 When you connect to the net, unscrupulous hackers can get in to your computer, accessing personal information or taking control of the way it’s run. They could even infect your system with a virus that gets into your email software and sends itself on to all of your contacts. The firewall is a filter for incoming (and outgoing) information. If anything remotely suspicious attempts to get through, the firewall blocks it. You can usually decide how strict you want your firewall to be. Built-in firewall: When you buy a computer equipped with Microsoft Windows, it already has a built-in firewall. Keep this switched on until you choose to upgrade to a commercial firewall. Physical firewall: This connects your computer to your modem, ‘hiding’ your computer (and its IP address) from the world. Your router may already have a firewall built in to it. When you buy a new one, check it has. This is an extra layer of security – not a substitute for firewall software. Firewall software: Software such as Zone Alarm and Norton provide two-way protection for your computer. This means that hackers and snoopers are prevented from accessing your information, and viruses are prevented from spreading outwards. Security Software ‘Suites’: The biggest names in computer security, Norton and McAfee, both provide antivirus and firewall all-in-ones. Norton’s version is preferred by PC Mag, although both have attracted criticism and praise. The best idea is to try one out, and see how you get on. Anti-spyware software is free and widely available. Spyware is a programme that embeds itself in your computer and sends information back to its (often unscrupulous) operators.